Imagine how often it’s used throughout the day. You use it to help you get out of bed, to raise your fork or spoon to your mouth and to reach to get a glass from a cabinet. 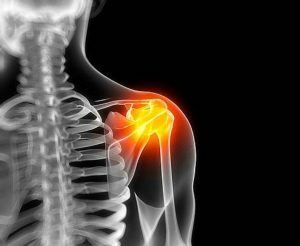 However, like other joints in the body, the shoulder is vulnerable to injury, as well as wear and tear. In fact, the shoulder is more susceptible to injury because of its unique ability of motion. The shoulder has a tremendous amount of motion, but that vast motion also allows for lesser stability. In other words, you can move your shoulder to a greater degree, but that allows for a greater risk of injury. There are some common issues that can occur with the shoulder. Some problems are more acute and some can be longer standing. The shoulder is susceptible to arthritis in the glenohumeral joint (ball and socket) as well as the acromioclavicular joint (AC joint on top of the shoulder). Through overuse or injury, these joints can develop arthritis causing pain, inflammation and lack of mobility. The muscles and ligaments of the shoulder can be over worked, causing minor tears. This is often referred to as sprains (of the ligaments) or strains (of the muscles). The Rotator Cuff is a group of several muscles of the shoulder. As we age, the muscles of the Rotator Cuff can weaken leading to a greater risk of injury. Injuries from falls and lifting injuries are common in these muscles. It is always best to take care of your shoulders and try to prevent any problems from occurring in the first place. This is often done through flexibility and exercises of the shoulders that can help greatly. Simple stretches and strengthening of the muscles in and around the shoulder can help to prevent shoulder injuries from taking place. However, it’s important to understand that these should begin slowly and work your way up to better health of the shoulders. In the event that an injury has already occurred, you should see your healthcare provider for evaluation. Treatment often occurs with physical therapy, which can be very helpful in helping you to recover from your shoulder injuries.